Look at the illustration below. Does it look familiar? 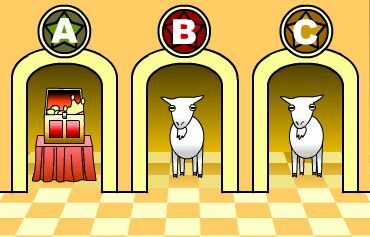 Do you remember sometime back in 1990s when “Monty Hall problem” became one of the most popular television game show worldwide? It is a kind of probability puzzle. A well-known statement of the problem was published in Marilyn vos Savant's magazine column “Ask Marilyn” in 1990. For better use of it, I myself tried to find the truth about it to help my friends, co-workers, teachers, doctors, patients, job-seekers, travellers and many other interested parties. Of course, I modified the above system and gathered about 300 university students, factory workers, and office workers, to find out a better application of it to guide us for right answers using this system. Our research and studies showed that it gave a probability of more than 75% positive answer. We were so delighted with its outcome, so we thought of applying it for several categories to find the possibilities of choosing the right answer for trouble-laden people of the world. Is it possible? Whether you believe it or not, we did it! Why don't you try it by yourself, too? Yes, it helps positively. Applications are uncountable...for job-seekers, travelling guide, get-well messages, judging decisions, and many more. With this system, we were able to help breast cancer patients who are worried and undecided if they're going to take surgery or not. We are now even applying it for gravely ill people for them to find out the answer whether they can live or not. They enjoy this as a game and at the same time, many were able to choose to live. Better than PYRO-ENERGEN, isn't it?